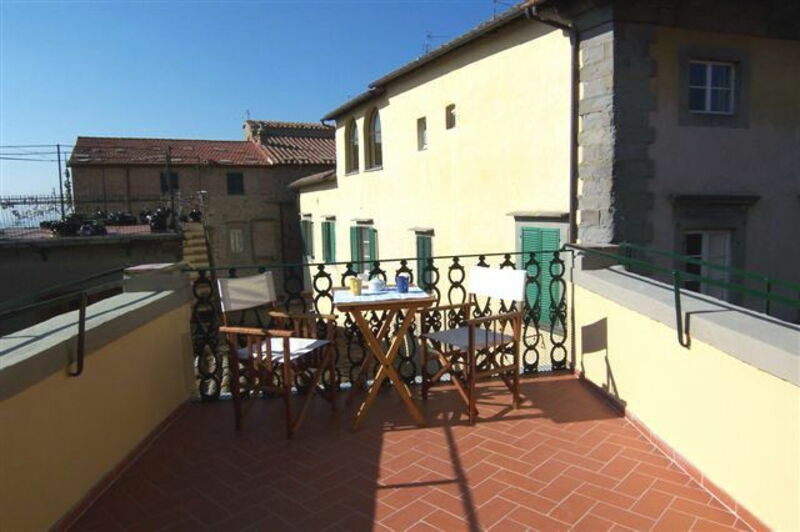 Beautiful apartment on the second and top floor of a building in the city centre of the pretty Etruscan-Medieval village of Cortona. The apartment is in a very panoramic location and offers beautiful views over the Valdichiana. The furnishing is accurate and comfortable. Distances: Cortona city centre with all kind of shops and the splendid Duomo approx. 100 m, Arezzo 30 km., Perugia 45 km., Siena approx. 70 km. At guests’ disposal: large panoramic terrace (10 m2) furnished with table, chairs and deckchairs. Ironing facilities available. Public parking area. The apartment is equipped with air conditioning. Extra services: maid service available by arrangement (to be paid locally). WI - FI Internet connection: € 10,- / per week (clients are supposed to have their own computer). 2nd floor: living-room with kitchen corner (freezer, micro-waves oven, toaster, dishwasher) and dining area, bathroom with shower (washing-machine), living-room with double sofa bed (LCD satellite TV, stereo) and access, througt 5 steps, to a private equipped terrace, double bedroom. Local Tax: 2,-€ per person per night for the first 4 nights of the stay (not applicable to children under 12 years).